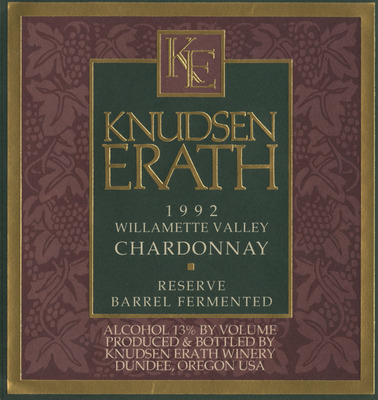 This wine label from Knudsen Erath Winery describes its 1992 Reserve, Barrel Fermented, Willamette Valley Chardonnay. Knudsen Erath Winery, "Knudsen Erath Winery 1992 Willamette Valley Chardonnay Wine Label" (1992). Erath Winery Photos. Image. Submission 17.